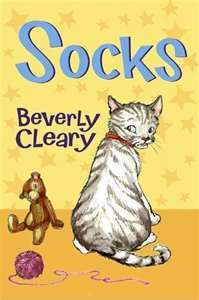 Socks is written in true Beverly Cleary style. The cat for whom the book is named was the Bricker’s only pet, pampered, loved and a little spoiled. But his mistress’ comfortable lap began to shrink, and then one day Mr. and Mrs. Bricker brought home a new pet. One that wailed and smelled funny and stole all the attention that used to be lavished on Socks. Written for ages six to nine (though probably independent only for the upper half), Socks will resonate with any child who’s owned a pet or been part of an expanding family, and it will lend the experiences to children who haven’t. It’s a light-hearted read, told from the perspective of a slightly selfish, slightly arrogant cat who gets into lots of mischief, from stealing wieners off the counter to destroying Nana’s wig while she sleeps. And can’t every kid identify with being just a little self-centered and naughty? Socks’ antics are sure to draw lots of smiles. Cleary’s works always includes an overarching theme of family–of love, acceptance and togetherness–and this one’s no exception. The Bricker’s family simply includes a rambunctious but lovable, four-legged member named Socks. I’ve heard of this book but never read it. I like her Ramona series. I like books about pets. I’ll have to check this out! My boys enjoyed this one because Socks was always thinking and doing exactly what our cat would do. And I just love Cleary’s style. Same with me, I’ve heard of it, but never read it. Thanks for the idea, I’m definitely checking that out at my school library. My favorite book by her is Dear Mr. Henshaw, even though I’m a little old for it, the classics are always good! This one is for younger middle readers, but it’s really cute. And quick.